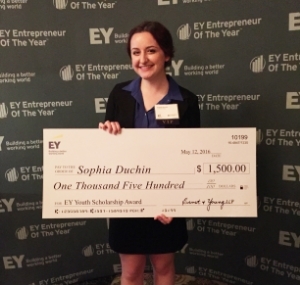 Junior Sophia Duchin was awarded the EY 2016 Western Pa Youth Entrepreneur Award May 12th at the finalist reception at the Duquesne Club in Pittsburgh. Sophia won the award partly based on a business plan she created focusing on creative ways to solve indoor air pollution. The $1.500 funding is to help her develop, design, build, brand, market and sell a product of her own creation by partnering with local retailers. Pittsburgh business owners are already working to help guide and mentor her. Sophia said her idea for the business plan generated from the conversations and knowledge she learned in her environmental science class with Mr. Vince Scalzo. She said she has been fortunate to have had amazing science teachers like Mr. Scalzo, Mr. Mike Hathy and Mr. Andrew Haberberger. Sophia was nominated for this award by 412Build, a summer program in Pittsburgh that teaches students ages 16-18 entrepreneurship and maker skills at TechShop, a 16,000 square foot Makerspace/workshop in Bakery Square. 412Build also partners with AlphaLab Gear, Innovation Works and City of Play. Last summer, Sophia had an internship at 412Build. Sophia was part of a team that worked with community members to help develop a project they needed, which was a playground Her team took classes in areas including welding, wood shop and machine shop, laser cutters, 3D printers, CNC machines and more. They designed and built playground equipment for Kite Hill Park in Garfield, and they invited community members to the grand opening. Sophia has been invited to the Western Pennsylvania and West Virginia EY Entrepreneur of the Year Awards gala on June 24th at the David Lawrence Convention Center.